Not only was the idea of a Bantha toy kicked around at Kenner during the waning days of their Star Wars product line, that of a Grand Moff Tarkin figure--everyone's choice as the winner of the "gee-I-wish-they-had-made-that-figure" pageant--apparently was as well. Unfortunately, no concept art or three-dimensional figure prototypes have surfaced. 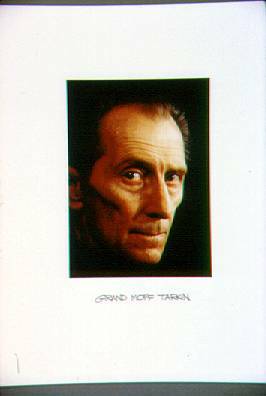 Rather, we are left with this presentation piece--consisting simply of what appears to be a mounted photo of Peter Cushing, and the hand-printed title "Grand Moff Tarkin"--as one of the very few pieces of evidence that the figure may have indeed been considered for a post-POTF release. Much of the information regarding the Tarkin concept, as well as the existence of other unproduced conceptual material, was first brought to light by collecting guru, Steve Sansweet, who covered these concepts and prototypes in issue #2 of Star Wars Galaxy Magazine.